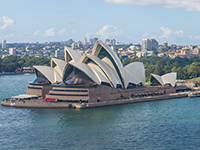 Among the world-renowned attractions of Australia include the Sydney Opera House, Sydney Harbour Bridge and the spectacular sights of natural wonder the Great Barrier Reef. Around 620,000 British nationals visit Australia every year, which can only be travelled to by airplane due to its 15,196 km distance from the United Kingdom. It will take roughly a day to travel to Australia, so travellers with diabetes are urged to devise a management routine beforehand with your diabetes team that allows for the greatest control of your blood sugar levels. Flying from London to Sydney will require around 21 hours of travelling time, on average, although travelling to Perth, which resides on the opposite side of Australia to Sydney, will take roughly 18 hours from London. Australia has 13 time zones, so researching how far ahead the time is in your destination will be crucial in assessing how to manage your diabetes upon arriving. Sydney is 11 hours ahead of Greenwich Mean Time (GMT), whereas Brisbane is 10 hours ahead. Wherever your destination in Australia, you should be prepared for a lengthy time difference. You should discuss how best to medicate your diabetes with a member of your diabetes team, while monitoring your blood sugar more often will be necessary for the first few days. Australia's seasons are opposite to those in the northern hemisphere. December to February is summer, which sees an average temperature of 20°C, while June to August is more comparable to the UK winter and has an average of 12°C. If travelling during Australia’s winter, diabetes medication may not be affected, but greater considerations may be required for people visiting during the summer. Insulin absorption can be affected by warm weather, so blood sugar levels should be checked more often if you take insulin and are susceptible to hypoglycemia. You could consider reductions in your dosage if you are planning activity or exercise, while carrying sugar on you at all times will be essential. There are no mandatory vaccinations to enter Australia, however some are recommended. You should consult your doctor eight weeks prior to your departure in order to receive the vaccinations in time. Some travellers are recommended to get vaccinations for rabies and hepatitis B, while hepatitis A can be contracted through contaminated food and water. Vaccination against Japanese Encephalitis may also be recommended for travellers visiting remote areas of Australia for more than a month, depending on what time of year you are travelling. There is no risk of yellow fever in Australia, although the government of Australia requires proof of yellow fever vaccination if you have travelled from a country with a risk of the disease. Australia has a reciprocal healthcare agreement with the United Kingdom. Your passport will need to be shown as identification when purchasing medication, but it will be provided at a reduced cost or, in some cases, free. Treatment at public hospitals is free but you'll have to pay for treatment at most doctors’ surgeries, prescribed medicines and ambulance travel. You will need identification in the form of a document such as a passport that proves you live in UK, as well as proof of address from either a driving license or utility bill. Before or after treatment, you will need to enrol at a local Medicare office. Blood and urine testing kits are available through the National Diabetes Service Scheme (NDSS) and pharmacies. You should note which syringes are available in Australia, with U-100, U-40 and U-80 syringes commonly used. The emergency services telephone number to be called in Australia is 000. It is also advisable to contact the manufacturing company of your medication prior to leaving the UK to find out what is available in Australia if your medication gets lost, stolen or damaged. It is also worth checking to see what different names your medication may be listed as. What sugar free drinks are available in Australia? Low-joule, diet and sugar-free drinks are widely available and clearly labelled on soft drinks and cordials.